Whole-transcriptome expression profiling provides novel phenotypes for analysis of complex traits. Gene expression measurements reflect quantitative variation in transcript-specific messenger RNA levels and represent phenotypes lying close to the action of genes. Understanding the genetic basis of gene expression will provide insight into the processes that connect genotype to clinically significant traits representing a central tenet of system biology. Synchronous in vivo expression profiles of lymphocytes, muscle, and subcutaneous fat were obtained from healthy Mexican men. Most genes were expressed at detectable levels in multiple tissues, and RNA levels were correlated between tissue types. A subset of transcripts with high reliability of expression across tissues (estimated by intraclass correlation coefficients) was enriched for cis-regulated genes, suggesting that proximal sequence variants may influence expression similarly in different cellular environments. This integrative global gene expression profiling approach is proving extremely useful for identifying genes and pathways that contribute to complex clinical traits. Clearly, the coincidence of clinical trait quantitative trait loci and expression quantitative trait loci can help in the prioritization of positional candidate genes. 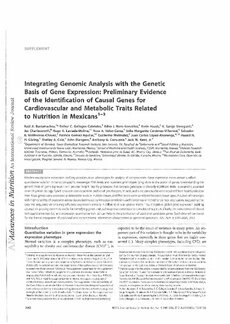 Such data will be crucial for the formal integration of positional and transcriptomic information characterized as genetical genomics.